24 cm 320 p. : ill.
'The bomber,' said Stanley Baldwin in 1932, 'will always get through'. 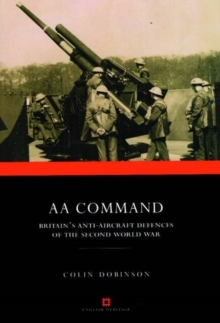 "AA Command" is the story of one attempt to prove a politician wrong. Drawing upon a wealth of original documents and first-hand accounts, it tells the story of Britain's anti-aircraft defences on the home front during the Second World War: In the Battle of Britain, the Blitz, and the Luftwaffe's cruel campaigns against cathedral cities and coastal resorts. But it does more. Originally commissioned to support English Heritage's initiatives to preserve England's wartime remains, "AA Command" is also a study of the everyday places where the battle was fought. Thousands of gun batteries were built during the war. By exploring their design and patterning, "AA Command" offers a new perspective on Britain's defence geography and rediscovers the sites that were home to hundreds of men - and women.